When it comes to choosing the right skid steer tire for your machine there are many factors to consider. Tread depth, wear life, performance, cost and your specific application needs. Here we compare the differences between Evolution Wheel's EWRS-AT solid skid steer tire and the primex bossgrip skid steer tire. First, let's take a look at comparing the product specifications of each skid steer tire model. When it comes to choosing the right skid steer tire for your machine there are many factors to consider. Tread depth, wear life, performance, cost and your specific application needs. 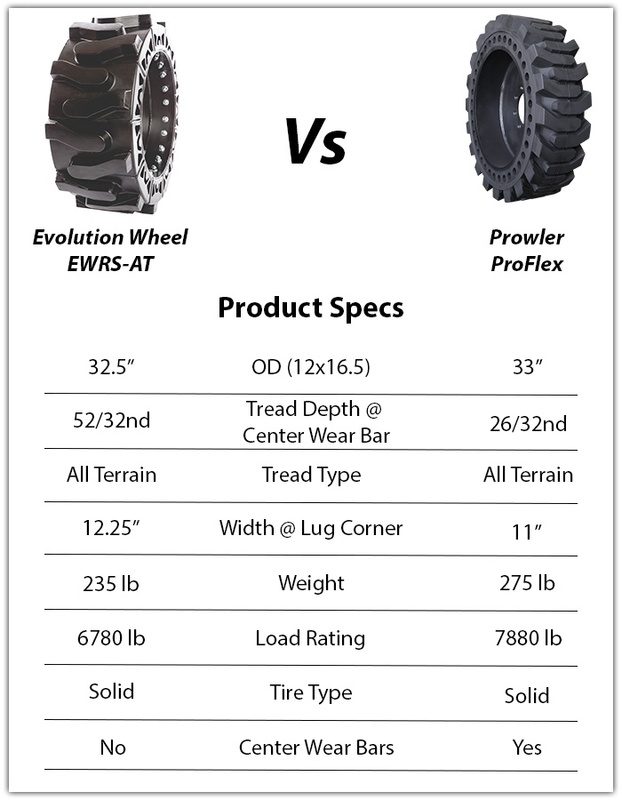 Here we compare the differences between Evolution Wheel's EWRS-AT solid skid steer tire and the prowler proflex solid skid steer tire. First, let's take a look at comparing the product specifications of each skid steer tire model. When it comes to choosing the right skid steer tire for your machine there are many factors to consider. Tread depth, wear life, performance, cost and your specific application needs. Here we compare the differences between Evolution Wheel's EWRS-AT solid skid steer tire and the earthforce solid skid steer tire dt. First, let's take a look at comparing the product specifications of each skid steer tire model. When it comes to choosing the right skid steer tire for your machine there are many factors to consider. Tread depth, wear life, performance, cost and your specific application needs. Here we compare the differences between Evolution Wheel's EWRS-AT solid skid steer tire and the ty cushion solid tire f pattern. First, let's take a look at comparing the product specifications of each skid steer tire model. When it comes to choosing the right skid steer tire for your machine there are many factors to consider. Tread depth, wear life, performance, cost and your specific application needs. Here we compare the differences between Evolution Wheel's EWRS-AT solid skid steer tire and the setco solid tire s mine. First, let's take a look at comparing the product specifications of each skid steer tire model. When it comes to choosing the right skid steer tire for your machine there are many factors to consider. Tread depth, wear life, performance, cost and your specific application needs. Here we compare the differences between Evolution Wheel's EWRS-AT solid skid steer tire and the summit supply skid steer tire ub1220. First, let's take a look at comparing the product specifications of each skid steer tire model. When it comes to choosing the right skid steer tire for your machine there are many factors to consider. Tread depth, wear life, performance, cost and your specific application needs. Here we compare the differences between Evolution Wheel's EWRS-AT solid skid steer tire and the sentry vd solid skid steer tire. First, let's take a look at comparing the product specifications of each skid steer tire model. When it comes to choosing the right skid steer tire for your machine there are many factors to consider. Tread depth, wear life, performance, cost and your specific application needs. Here we compare the differences between Evolution Wheel's EWRS-AT solid skid steer tire and the mwe solid skid steer tire. First, let's take a look at comparing the product specifications of each skid steer tire model. When it comes to choosing the right skid steer tire for your machine there are many factors to consider. Tread depth, wear life, performance, cost and your specific application needs. Here we compare the differences between Evolution Wheel's EWRS-AT solid skid steer tire and the west lake cl718 skid steer tires solid skid steer tire. First, let's take a look at comparing the product specifications of each skid steer tire model. When it comes to choosing the right skid steer tire for your machine there are many factors to consider. 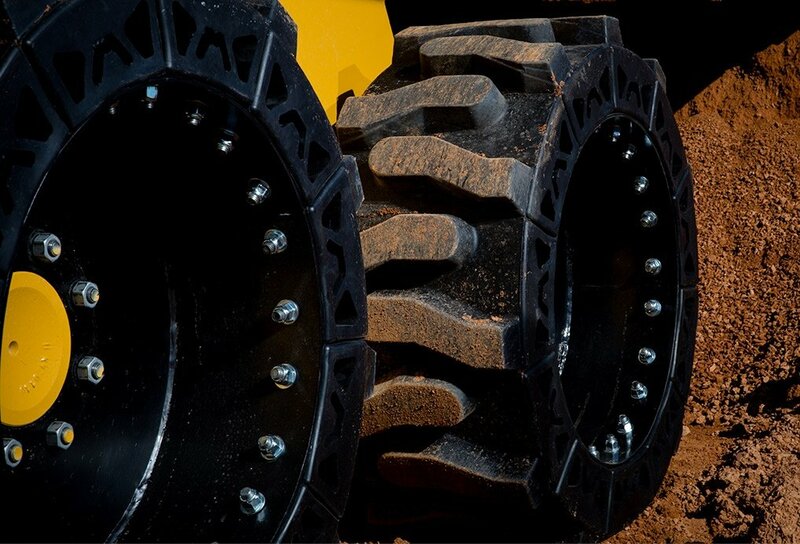 Tread depth, wear life, performance, cost and your specific application needs. Here we compare the differences between Evolution Wheel's EWRS-AT solid skid steer tire and the titan hd 2000 skid steer tire. First, let's take a look at comparing the product specifications of each skid steer tire model.